Did you know your brain and spinal cord are responsible for controlling your entire body? Your spinal cord is protected by the spine, which has bones or vertebrae that go from your neck to low back. Nerves exit your spine that go to the muscles, organs and tissues of the body. From stress, trauma or injury your vertebrae can become misaligned, putting pressure on these nerves. So, how do you know if you have misaligned vertebrae? 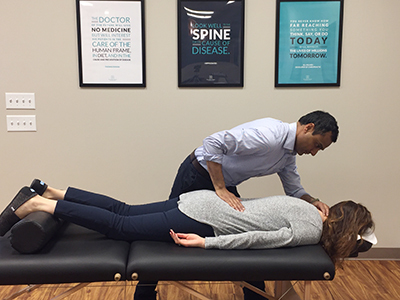 At Align Health and Wellness, Dr. Gill performs a thorough examination that includes the detection of problems in your spine and entire body, from head to toe. We also use motion X-rays to identify the cause of your issue and to understand how best to correct them. We offer different types of care based on your needs. When you’re in acute pain, we begin relief care to help you feel better quickly. Most people are looking for permanent correction rather than a patch, so we’ll make sure your issue doesn’t recur with corrective and strengthening care. Dr. Gill is well-versed in several different adjusting techniques, both instrument-based and manual, including Diversified and Torque Release Technique™ (TRT). TRT is a gentle, specific method that utilizes an instrument without any twisting, cracking or popping of the joints. Dr. Gill was trained by its founder, Dr. Jay Holder, in this modern, scientific technique. Research shows that it may not only help common types of pain but those with anxiety, low energy and insomnia, too. If you prefer a certain technique or feel apprehensive about manual adjustments, please let us know, and we’ll be happy to accommodate you. Spinal decompression is also available at our office. This form of nonsurgical treatment is ideal for sciatica, disc problems and degeneration of the spine. Dr. Gill is certified in auriculotherapy (ear acupuncture) to assist those who wish to quit smoking. Contact us today to schedule your appointment! Same-day visits are available, and we offer a new patient special for $39 (a $325 value). We welcome the opportunity to share the benefits of chiropractic care with you.